Hall of the Mountain King: Review: Slash, "Apocalyptic Love"
After being less than impressed with Slash’s last solo album and its parade of guest stars, and being only a marginal fan of Velvet Revolver or Slash’s Snakepit, I didn’t go into Apocalyptic Love with my hopes too high. Sure, I figured there would be a few good songs among a lot of uninspiring filler, but I was completely unprepared for what I got: This, friends and neighbors, may well be the best record that Slash has been involved with since Appetite for Destruction. I’ll admit up front that I’m not sold on Myles Kennedy as a vocalist for this style. There’s no denying that the guy has a fantastic voice, but there are still times here when I’d much rather he use a little less range and a little more attitude. That said, I think he manages to provide a very good foil for Slash, and the record is much the better for it. It’s almost like there are two bands at work – one an old-school, down-and-dirty Guns n’ Roses type of hard-rock band, the other a more modern-rock outfit with some alternative leanings. Though individual songs may swing one way or the other, they usually meet somewhere in the middle with great results. I’ll start with the song that’s been running through my head incessantly for the past week or so, and my favorite number of the album, “Halo.” Slash’s main guitar riff on the song is pure Appetite-era G n’ R energy. Kennedy then brings a more modern feel to the verse with his lilting voice, but that riff kicks back in for the infectious chorus and Kennedy delivers it with just a hint of an Axl Rose snarl in his voice. That’s something that pops up often throughout the record. There’s never a point where you feel that they’re actually trying to resurrect the Guns n’ Roses sound, but there’s a riff here, a vocal inflection there, and it puts the listener right in that headspace. That punk energy that Guns n’ Roses used to great effect is also on display here, most notably in “One Last Thrill,” which wouldn’t have been at all out of place on one of the Use Your Illusion records. “Shots Fired” might be the most G n’ R-like track on Apocalyptic Love. In fact, musically, I’d almost believe it was a leftover tune from the recording sessions for one of those records. Kennedy also apes Rose at times on the song — though Axl, I don’t believe, would ever be able to pull off the big notes on the chorus. There’s also a heavy 1970s-rock vibe running through the record. That’s announced early on with the title track. It’s a great, grooving song with a Southern-flavored harmony on the chorus that’s just fantastic. Those big harmonies return on the refrain from “Bad Rain,” with a slinky riff that’s just too cool a combination to ignore. “Hard and Fast” is a straight-up, screaming ’70s rocker. “Standing in the Sun” reminds me, oddly enough, of Elton John. “Not for Me” opens with the forlorn lead guitar sound of one of Aerosmith’s better 1970s ballads, though the song itself is more grounded in 1990s alternative. That brings me to my second-favorite song on the record, and probably the most offbeat – “Anastasia.” If this song is not absolutely huge, there’s something really, really wrong with the world’s ears. It opens with Slash doing a rare soft acoustic piece. Even more rare, it’s a neo-classical piece, which I’m not 100 percent positive, but fairly sure Slash has never done before. That kicks into an electric neo-classical riff, followed by the kind of rough and skuzzy guitar lick that you’re expecting from Slash. But then the chorus rolls around, and Kennedy brings a big pop sensibility to it. It ends with a couple of minutes of shred for Slash that blend classical and hard rock themes. It’s incredibly catchy, a little out of left field and completely awesome. The record ends with a couple of bonus tracks that may not quite fit with the rest of the songs, but are both great. “Carolina” is again steeped in that 1970s sound with a funky talkbox main riff. The chorus isn’t quite as strong as some of the others on the record, but that talkbox lick more than makes up for it. Then there’s the country and blues-flavored “Crazy Life” that plays like a cross between Aerosmith and Led Zeppelin. It gives Kennedy a chance to strut his Robert Plant-style chops a little bit, and like pretty much everything on Apocalyptic Love, it’s amazingly catchy. I am, quite frankly, stunned by how much I like this record. With each listen the combination of Slash and Kennedy grows on me a little more, and at the end of writing this review, I’m already reconsidering the line I wrote at the beginning about not being sold on Kennedy. Don’t expect a return to Guns n’ Roses or Velvet Revolver. Though there are elements of everything that Slash has done and then some in this record, it is its own beast. 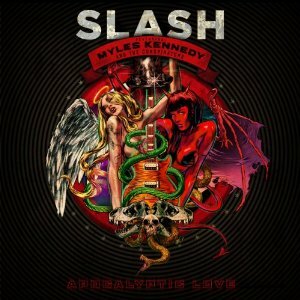 Apocalyptic Love is almost as impressive an introduction to the new Slash sound as Appetite was for his previous band, and hopefully, this collaboration will produce better follow-up results. I never would have believed it, but this one will definitely be an album-of-the-year candidate on my list.